A medal dealer (Gordons) advertised the following in their Winter Catalogue 2003. They appear to have been estimated at £675 and on the back cover there was a picture of the undermentioned. He was the third son of George Pomeroy Colley, of Rathangan, County Kildare, Ireland, and grandson of the fourth Viscount Harberton. He joined the 2nd Bn The Queen's Royal West Regiment from Sandhurst as ensign in 1852. From 1854 to 1860, he served in South Africa and was employed in surveying and as a magistrate in charge of the Bashi river district in Kaffraria. Early in 1860 he went with his regiment to China to join the Anglo-French expedition and took part in the capture of the Taku forts and the entry into Peking, returning to South Africa to complete his work in Kaffraria (brevet-majority). In 1862 he entered the Staff College and passed out in one year with honours. After serving as brigade-major at Devonport for five years, he went to the War Office in 1870 to assist in the preparation of (Lord) Cardwell's measures of army reform. He was appointed professor of military administration at the Staff College in 1871. 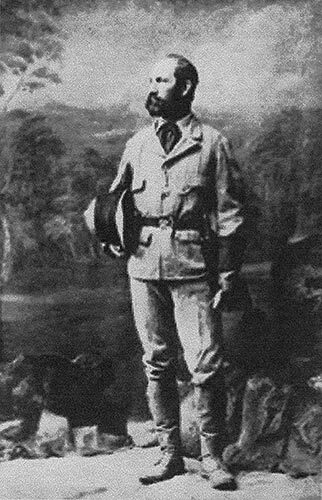 Early in 1873 he joined Sir Garnet Wolseley at the Gold Coast, where he took charge of the transport, and the success of the Ashanti expedition was in no small degree due to his exertions. He was promoted brevet-colonel and awarded the CB. In 1875 he accompanied Wolseley to Natal (CMG). On his return home he was appointed military secretary to Lord Lytton, governor-general of India, and in 1877 private secretary (KCSI). In 1879 he joined Wolseley as chief of the stall' and brigadier-general in SE Africa, but, on the murder of Cavagnari at Kabul, returned to India. In 1880 he succeeded Wolseley in SE Africa as high commissioner and general commanding, and conducted the operations against the rebel Boers. He was defeated at Laing's Nek and at the Ingogo river, and killed at Majuba Hill on 27 February 1881 . He had a very high reputation not only for a theoretical knowledge of military affairs, but also as a practical soldier. He was born on the 1st November and was killed on the 27th February 1881.